As part of its departure from focusing on the bottle, this new TBWA\Chiat\Day-created commercial for Absolut Vodka examines a world which appears to be ruled by Pam Anderson and her fellow bikini-clad pillow fighting babes of yesteryear. During a standoff between shield bearing police officers and protesters, an altercation far different than those 60's-style, Abbie Hoffman-like riots new age historians are so fond of showing occurs. Whether Absolut is the cause or the solution to this unrest is unclear but the spot sure looks like it was fun to shoot. Well here's some interesting commentary on stereotypes and suicide. As a hooded man approaches an elderly man who has just parked his car in a deserted rooftop parking lot, the elderly man cowers in fear the hooded man is about to mug him. Instead, the hooded man passes him by and heads for the edge of the rooftop as the elderly man realizes the ongoing scenario is much different that what he initially assumed. The spot is part of a British campaign calling attention to the fact suicide claims the lives of three men each day. It's always nice when an ad makes such good use of symbols, sounds and gestures that it doesn't need some unfortunate content guy to translate the text across 15 languages. This spot for groen.be just implores "Save Our Planet!" - which is apt, because that's what it's called. It could have been about 45 seconds shorter, though. Though it's hard to believe, people, apparently, still use the yellow pages. Or at least yellow pages publishers would certainly like people to.Or maybe it's just an Israeli thing. 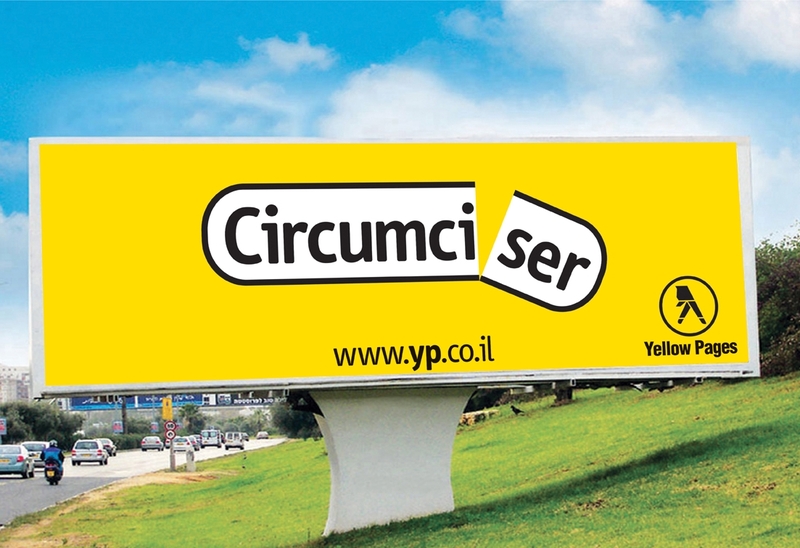 Young & Rubicam Israel sends us these outdoor boards which continue the endless creative twists that yellow pages categories offer for fodder. From circumcision to couples therapy, this campaign still finds humor in a decidedly boring category. See all the boards here and a TV spot here. There's nothing the assertive audience likes more than a company that puts all its cards on the table. So if you're going to be honest about pushing your hops, you might as well do it in an epic way: with a score, some choir robes dyed in primary colours, and a giant esophagus made up of burly men running in circles. There's more industry jabbing in another spot from the same series. "Fermented in a big metal thing!" We love that drama-soaked tone. Anheuser-Busch, which is trying really hard to get beer taken seriously, must be gnashing its teeth in aggravation. The spots fall under the tactful slogan "Made from Beer" and are for Carlton Draught. We hope they sell lots of bloody beer.